Modifications: No modifications – I went with Eating for England’s waffle recipe because it included cheese, and why wouldn’t I want that?! I forgot fresh parsley, so just used dried. Notes: I really loved how easy this meal was! 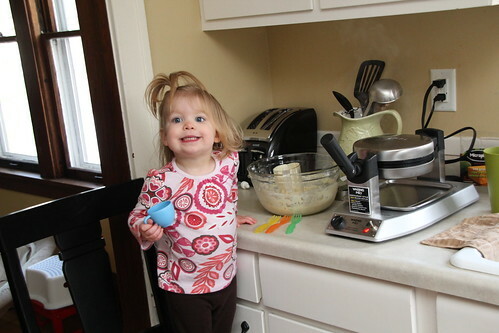 Annie LOVES helping (almost too much) and especially loves helping with waffles. She greatly enjoys watching the light go from orange to green when the waffles are done. This was a super quick weeknight meal (that we made on a weekend, but every meal needs to be quick with a newborn and a toddler right now!). 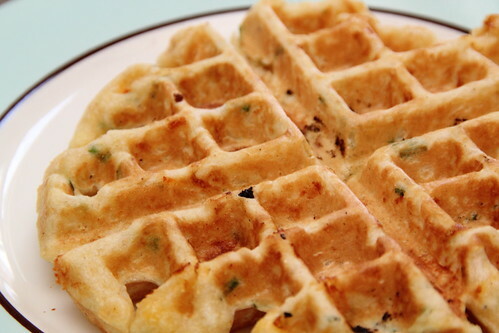 Great for a savory breakfast, or breakfast for dinner. We used our homemade salsa for this. 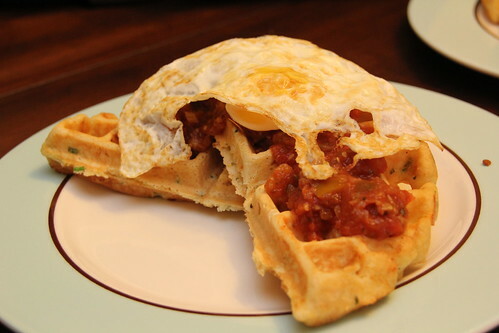 This entry was posted in breakfast, cheese, cornmeal, eggs, salsa, vegetarian. Bookmark the permalink. Where did you get that awesome waffle maker?! Those look good!